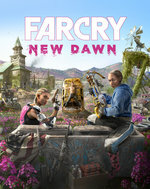 Far Cry: New Dawn takes what Ubisoft established in Far Cry 5 and runs with it into a brave new post-apocalyptic future. Don't take the lack of a number in the title to mean that New Dawn is an expansion - it's a full-blooded game with an open world all of its own, even if it is eerily familiar. The game returns players to a wildly beautifully and massively transformed Hope Valley 17 years after America's been ravaged by an apocalypse. The setting is being pitched as a return to America's frontier days, albeit with AR-15s in place of bows and arrows (although it's not unreasonable to think you might get to play with those, too). The residents of the county have made something of a life for themselves, farming the land with cobbled together equipment, but the roving Highwaymen are moving in and trouble's brewing. Throw in the new villains of the piece, twins Vicky and Lou who grace the cover, and you've got a job on your hands. The game builds on the gameplay systems of Far Cry 5. You'll roam an open world, claiming territory, gathering resources and getting into scrapes as the battle between the two factions rages. As with the Assassin's Creed franchise, Ubisoft is leaning into the RPG elements of the game than it has in the past. In terms of new additions, expect changes to how you can interact with animals - you get a dog called Timber for companionship and there's a wild boar called Horation in the mix. The Fangs for Hire system has improved a little, with your animal pals now able to travel in vehicles with you. Similarly, the Guns for Hire system has some new additions, such as the foul-mouthed Nana, a mean old sniper, and Carmina, daughter of Far Cry 5's Nick who you helped deliver in the last game. You'll set up shop at Homebase, where you can craft makeshift weapons and vehicles and take off on Expeditions - missions that will take you across America to locations like wetlands and canyons. 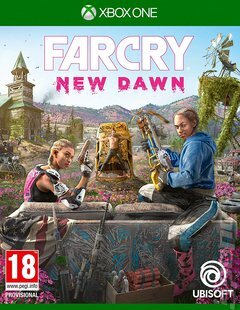 Far Cry: New Dawn throws you into a hard world with lots of post-apocalyptic fun to be had!